Definition: The Monopoly is a market structure characterized by a single seller, selling the unique product with the restriction for a new firm to enter the market. Simply, monopoly is a form of market where there is a single seller selling a particular commodity for which there are no close substitutes. Under monopoly, the firm has full control over the supply of a product. The elasticity of demand is zero for the products. There is a single seller or a producer of a particular product, and there is no difference between the firm and the industry. The firm is itself an industry. The firms can influence the price of a product and hence, these are price makers, not the price takers. There are barriers for the new entrants. 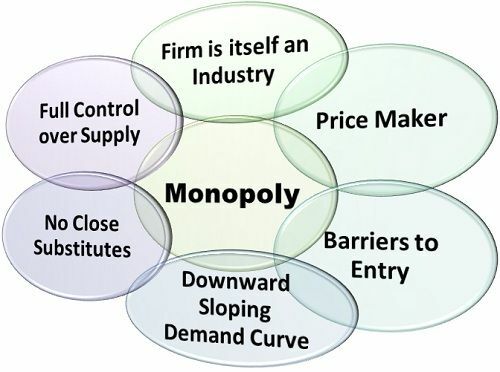 The demand curve under monopoly market is downward sloping, which means the firm can earn more profits only by increasing the sales which are possible by decreasing the price of a product. There are no close substitutes for a monopolist’s product. Under a monopoly market, new firms cannot enter the market freely due to any of the reasons such as Government license and regulations, huge capital requirement, complex technology and economies of scale. These economic barriers restrict the entry of new firms. Quite helpful notes indeed. Simple and straight forward. Keep it up. I have liked the page. This is one of best place to go, in terms of business and managerial issues. You guys are the Best. Brief, concise and very educative. Does cement industry comes under monopoly market structure in the economy?